Stroke severity and patient age are the two most important factors in predicting one’s chances of survival after a stroke. Stroke severity is measured by analyzing neurological impairments (in language and behaviors) and by conducting a CT scan or MRI. Medical professionals will also use the National Institutes of Health Stroke Scale (NIHSS), within 24 hours of a stroke, to measure neurological impairment and predict the chance of survival. Each point a patient scores, his or her odds of survival after three months decreases by 17 percent. The following studies examine the fatality rates of stroke so survivors and their families can better understand their outlook post stroke. 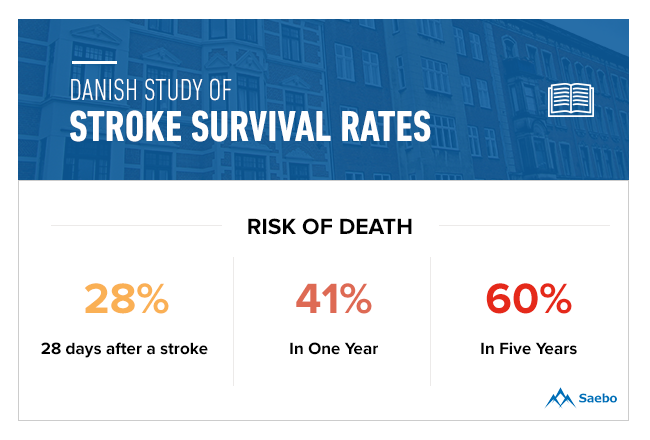 A Danish study included 5,262 stroke patients who suffered a stroke between 1982 and 1991. All stroke patients in this study were at least 25 years old. The study found that those who survived a stroke were five times more likely to die between four weeks and one year after the first stroke. They were two times more likely to die after more than a year passed. Fewer than 28 days after a stroke, the risk for death was estimated at 28 percent, but after one year, it was 41 percent; after five years, the risk increased to 60 percent. The study attributed excess mortality rates to other health issues, like cancer, cardiovascular disease and other diseases, suicide, or accidents. Another study analyzed 836 patients who suffered their first stroke between 1997 and 1998 in Tuzla, Herzegovina, and Bosnia. After one month, 36 percent of the patients died. The majority of these patients suffered from intracerebral hemorrhage. 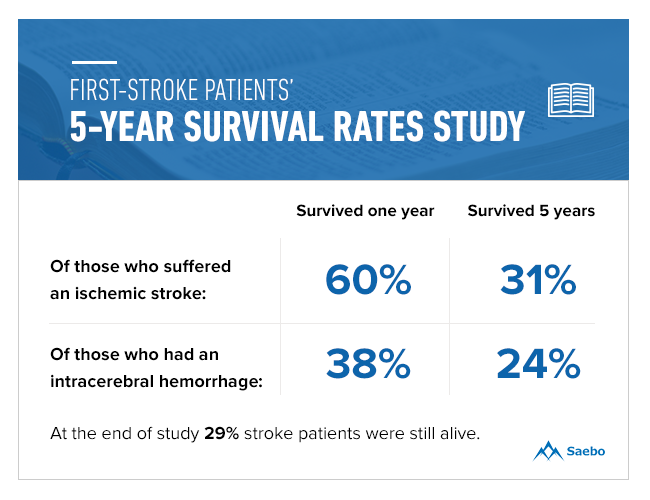 Of the surviving patients, 60 percent who suffered an ischemic stroke and 38 percent with intracerebral hemorrhage survived one year, compared to 31 percent and 24 percent, respectively, after five years. 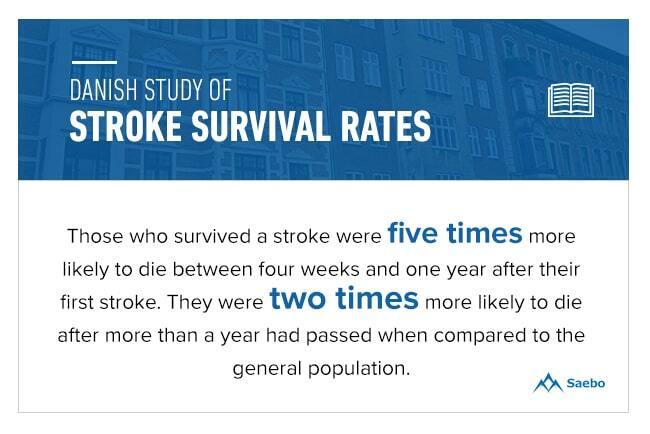 At the end of the study, 29 percent of the stroke patients were still alive. The study found that those 50 or younger had a higher survival rate than those 70 or older, at 57 percent and 9 percent, respectively. Additionally, the long-term survival rate (five years) is better in patients who suffered from intracerebral hemorrhage compared to those with ischemic stroke. However, those who suffered from intracerebral hemorrhage were more likely to pass away within the first 30 days of the stroke. A study was conducted on patients at Radbound University Nijmegan Medical Centre in the Netherlands who were admitted between January 1, 1980, and November 1, 2010. 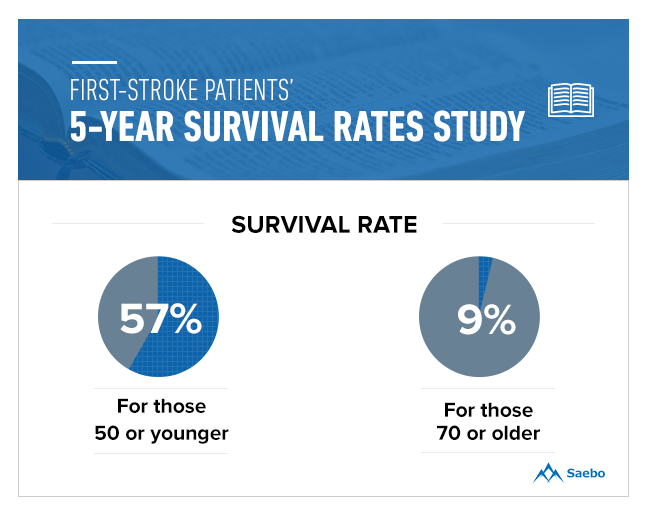 This study focused specifically on 18 to 50 year olds, since the long-term effects of first-stroke survivors in this age range is not widely studied. Another purpose of the study was to gain a more comprehensive look at stroke survivors by including those with ischemic stroke, intracerebral hemorrhage, and first-ever transient ischemic attack (TIA). The majority of the 959 patients studied suffered from ischemic stroke. 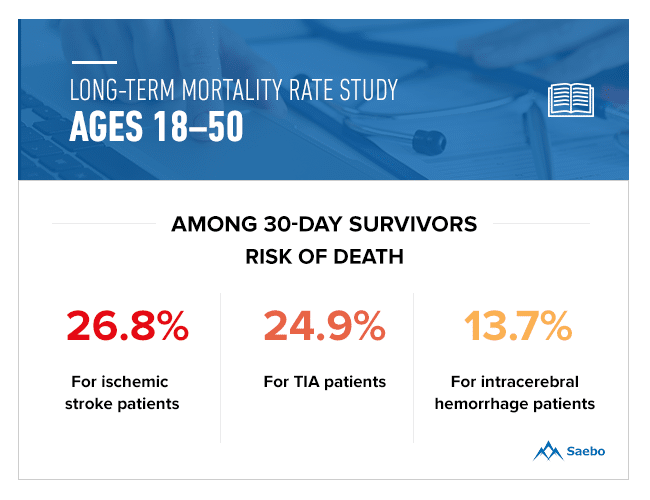 The study found that, among 30-day survivors, the risk of death by the twentieth year mark was highest for ischemic stroke patients, at 26.8 percent, with TIA sufferers close behind at 24.9 percent. Those with intracerebral hemorrhage had a 13.7 percent risk of death. Melina Gattellari, a senior lecturer at the University of South Wales, states that TIAs can have significant effects on long-term survival rates, much like a stroke. As TIA patients age, survival rates steadily decline, with a 4-percent decline in life expectancy after the first year and a 20-percent decline by the ninth year. England reviewed a collection of studies analyzing stroke patients in the U.K. between 1990 and 2010. 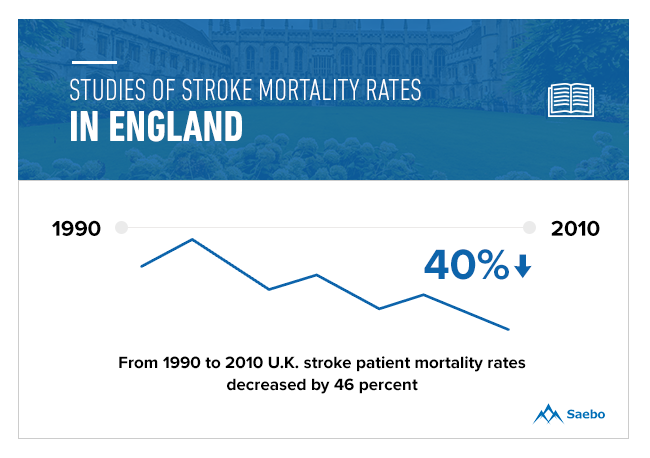 During this time, U.K. stroke patient mortality rates decreased by 46 percent. Although this shows an improvement in medical care for stroke patients, the State of the Nation stroke statistics makes it clear that stroke can still be fatal. By the time they reach their 75th birthday, one in five women and one in six men will suffer a stroke. In the U.K., stroke serves as the fourth highest cause of death; in the world, it’s the second. Out of those who suffered from stroke, three in ten will have a TIA or recurrent stroke. One in eight strokes will kill a survivor within the first 30 days and 25 percent within the first year. This is largely due to the disabilities nearly half of stroke patients will face after a stroke. A Canadian study was conducted on stroke survivors 61 years (on average) or older to determine the survival rates of the elderly population. 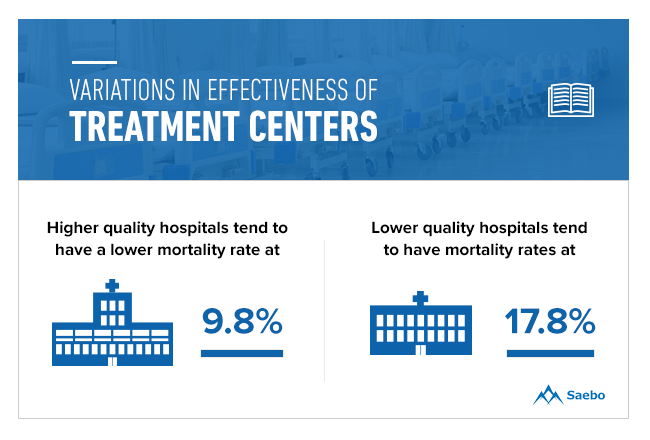 Over a third (38 percent) of the patients were at least 80 years old, and this group also had the highest mortality rates during their hospital stays, at 24.2 percent. Those under 59 years old died at a rate of 5.7 percent; ages 60–69 reached 8.6 percent; and those 70–79 passed away at a rate of 13.4 percent. Those over 80 who survived suffered from so many impairments that they were unable to return to their homes and, instead, had longer hospital stays or were cared for in medical facilities. A study on those who have United States Medicare benefits analyzed 91,000 patients who survived a stroke between April 2003 and December 2006. The patients were treated at 625 hospitals all over the country. The study found that almost two-thirds of Medicare patients would either need to be readmitted within a year or would die after discharge. 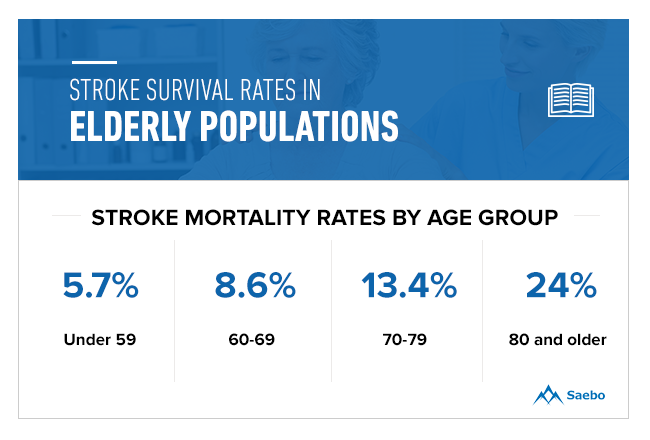 However, higher-performing hospitals saw a lower mortality rate in stroke patients (9.8 percent) than in lower-performing hospitals (17.8 percent). 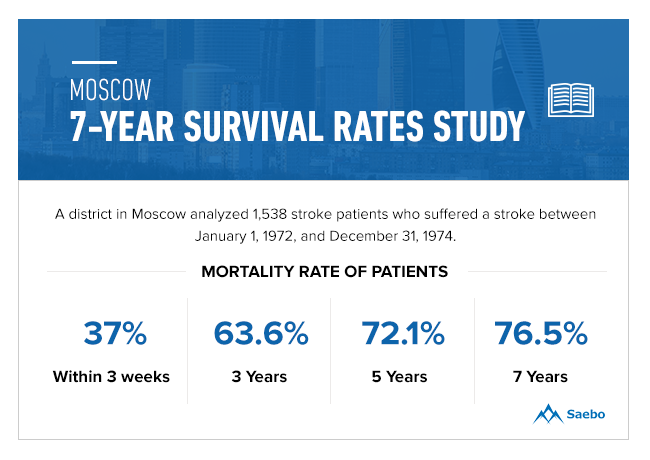 A district in Moscow analyzed 1,538 stroke patients who suffered a stroke between January 1, 1972, and December 31, 1974. The purpose of this study was to gain a better understanding of stroke survival rates over a longer period of seven years. This study found that within three weeks of suffering a stroke, 37.3 percent of the patients had passed away. Over the next seven years, the study followed 941 of the remaining stroke survivors to record both recurring strokes and deaths, while also finding links between recurring strokes and survival rates. In the first three months, not counting the first three weeks after stroke, most of the patients who did not survive suffered from pulmonary thromboembolism. After three years, 63.6 percent of the patients died. After five years, 72.1 percent passed, and at 7 years, 76.5 percent of survivors died. The study found that those who had multiple strokes had a higher mortality rate than those who suffered from other health issues, like cardiovascular disease. Interestingly, nearly half of all patients suffered from transient ischemic attacks. Strokes have always posed a series of intense complication for survivors. While treatment options have gotten better and initial treatments are better than they have ever been, it is important to understand that all stroke patients face significant hurdles in recovery.